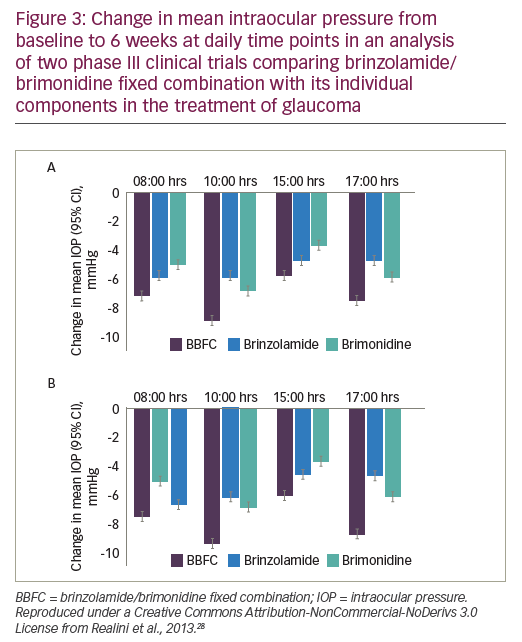 The fixed combination of brinzolamide 10 mg/ml and brimonidine 0.2% 2 mg/ml (BBFC; Simbrinza®) is an important addition to the glaucoma treatment choices currently available. Glaucoma is an increasingly prevalent disease worldwide, particularly in the elderly, and causes a serious burden of blindness. Fixed combinations of eye drops simplify treatment regimens, improving compliance, which helps maintain intraocular pressure (IOP) reductions. Registration of BBFC in Europe was supported by two phase III trials. 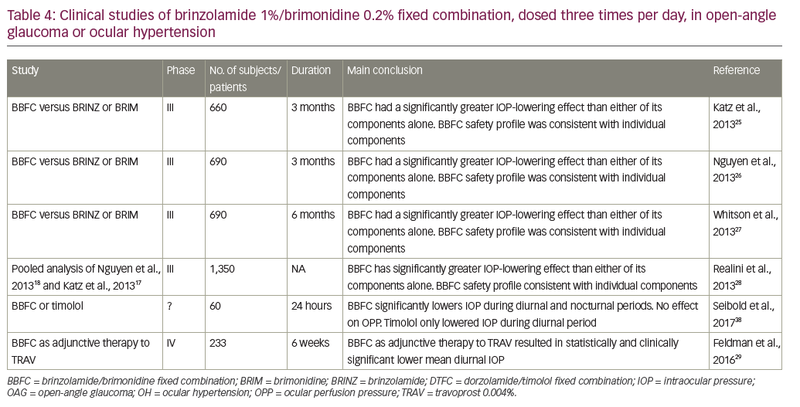 In the first (n=560), after 6 months of treatment, BBFC twice daily lowered IOP by –1.4 mmHg more than brinzolamide alone, and by –1.5 mmHg more than brimonidine alone (least squares mean differences, p<0.0001 for both versus BBFC). BBFC was well tolerated with a safety profile similar to its two components. In the other of these trials (n=411), BBFC was non-inferior to brinzolamide and brimonidine given as separate doses concomitantly (B + B). The adverse events were similar in each group, with a slightly higher incidence in the B + B group. In the US, registration of BBFC in glaucoma was supported by three phase III and one phase IV trials, which also showed significantly greater IOP reduction with BBFC compared with its components alone and showed similar safety profiles. Additional phase IV studies are in progress to evaluate the combined use of BBFC with travoprost and timolol. BBFC has been clinically available in the US and Europe for only a short time, but its clinical trial efficacy suggests it will have a positive impact on real-world glaucoma and may have utility for earlier administration than its current third- or fourth-line use. Stefano A Gandolfi has nothing to declare in relation to this article. Successful treatment for glaucoma is linked with good compliance/adherence,6 yet many patients with glaucoma, especially those without symptoms, require multiple medications for adequate IOP control and this requirement may lead to compliance problems and consequently reduced efficacy. Findings from treatment centre studies and database analyses demonstrate this issue, showing a direct correlation between the number of bottles prescribed and reduced patient compliance.6,7 Typical first-line treatment regimens for IOP reduction include prostaglandin analogues and beta-blockers. These have been used for over 20 years along with other established treatments such as carbonic anhydrase inhibitors (e.g., dorzolamide and brinzolamide), prostaglandins (e.g., latanoprost and travoprost) and alpha-2 adrenergic agonists (e.g., brimonidine). Combining topical therapies in glaucoma or using adjunctive therapies has been shown to increase IOP-lowering effects in various studies.8–12 Various fixed combinations of these treatments are currently available for topical glaucoma treatment (see Table 1). Among the fixed combinations is a product containing the carbonic anhydrase inhibitor brinzolamide 10 mg/ml and the alpha-2 adrenergic agonist, brimonidine 0.2% 2 mg/ml (BBFC; Simbrinza®, Alcon Laboratories, Inc., Fort Worth, TX, US). This combination is indicated for the reduction of elevated IOP in patients with OAG or ocular hypertension (OH). Each of the two components decreases elevated IOP by suppressing the formation of aqueous humour from the ciliary process in the eye.13 Brinzolamide acts by inhibiting the enzyme carbonic anhydrase (CA-II) in the ciliary epithelium that reduces the formation of bicarbonate ions with subsequent reduction in sodium and fluid transport across the ciliary epithelium, resulting in decreased aqueous humour formation. The other component, brimonidine, inhibits the enzyme adenylate cyclase and suppresses the cAMP-dependent formation of aqueous humour. Administration of brimonidine also results in an increase in uveoscleral outflow. The launch of BBFC in the European Union commenced in the UK in 2014, followed by other European markets later in 2014 and in 2015. In the US, BBFC was approved by the US Food and Drug Administration (FDA) and has been available on the market since 2013. The recommended dose is one drop in the affected eye(s) two times daily in Europe13 and, in the US, three times daily.13 BBFC has been evaluated for use in glaucoma in a series of phase III and some phase IV clinical trials. The key studies in which BBFC was administered two or three times daily are summarised in Tables 2 and 3, respectively. The purpose of this review is to consider the advantages of BBFC and assess the early evidence supporting its use in OAG and OH. A substantial advantage of fixed combination treatments for glaucoma is that they simplify dosing regimens and thereby improve patient compliance. Among these fixed combinations, a beta-adrenoceptor antagonist, usually 0.5% timolol, is most frequently combined with other drug classes.13–15 BBFC is unusual in that it does not contain this component. Despite its lower antihypertensive efficacy, the use of brimonidine to substitute for timolol in this combination does not affect overall efficacy.16,17 This is also advantageous and is partly explained by the dual modes of action of brimonidine involving aqueous production and facilitation of the uveo-scleral outflow.18 It appears that brimonidine has a substantial additive effect to brinzolamide, complementing its action and outweighing brimonidine’s lower hypotensive effect when used as monotherapy. The brinzolamide/brimonidine formulation is currently the only non-beta-blocker combination for glaucoma treatment that is available on the market. The novelty of this combination is the lack of a beta-blocker and the consequent reduction in cardiovascular side effects that can be caused by these agents. This is emphasised by a population study showing that during the years 2001 to 2012, there was a rise in the use of non-selective topical beta-blockers for glaucoma, especially timolol (2.2%/year), a decrease in the use of selective blockers such as betaxolol (-7.7%/year).19 There was also a rise in combination therapies containing a beta-blocker (7.6%/year). 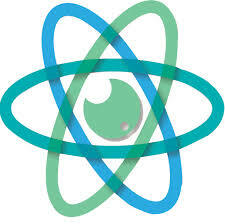 The authors commented that this practice may have a safety impact on vulnerable elderly patients. A recent cohort analysis showed that, among mainly elderly patients with glaucoma who were treated with a topical beta-blocker, there was a significantly higher (p<0.05) use of medical resources among those who discontinued the therapy.20 The investigators suggested a potential relationship between topical beta-blockers in glaucoma and adverse outcomes, particularly cardiovascular and respiratory conditions. As the only timolol-free fixed combination so far available, BBFC is now indicated to treat any patient with glaucoma who is unsuitable for beta-blockers (i.e., asthma, chronic obstructive pulmonary disease, severe bradyarrhythmia, severe heart failure). BBFC can also be used as adjunct to a prostaglandin analogue (PGA)-timolol FC to achieve maximum tolerated medical therapy21 (‘four drugs, three drops’) and to quickly get to potentially low target IOPs when needed. BBFC can also be used as adjunct to PGA monotherapy when beta-blockers are contra-indicated. The submission to the European Medicines Agency (EMA) registration for twice-daily eye drop dosing in glaucoma treatment was supported by two pivotal randomised, controlled trials (see Table 2). The first was a multinational, randomised, double-masked, phase III clinical trial in patients (n=560) with insufficient IOP control or who were receiving two IOP-lowering medications. After 6 months’ treatment, BBFC, administered twice daily, was significantly more effective in terms of IOP reduction than either of its components prescribed individually.22 In this study, for the primary end-point – mean change in diurnal IOP from baseline to month 3 – BBFC lowered mean diurnal IOP to a significantly greater extent than either of its individual components. At 6 months, the least squares mean changes in IOP from baseline were: BBFC, -7.8 mmHg; brinzolamide, -6.7 mmHg (p<0.0001 versus BBFC); brimonidine, -6.4 mmHg (p<0.0001 versus BBFC) (see Figure 1). Mean reductions in IOP from baseline at three daily time points (09.00, 11.00 and 16.00 hours) ranged from 26.7% to 36.0% with BBFC, from 22.4% to 27.9% with brinzolamide, and from 20.6% to 31.3% with brimonidine. The most frequent ocular side effect with BBFC, brinzolamide and brimonidine included: blurred vision (5.3%, 6.5% and 0.2%), eye irritation (4.1%, 1.3% and 2.2%), eye allergy (2.5%, 0% and 1.1%), ocular hyperaemia (2.1%, 0.7% and 3.3%), eye pain (2.1%, 0.7% and 1.1%) and allergic conjunctivitis (1.8%, 0.4% and 1.5%). Overall, the safety profile of BBFC was similar to that of its individual components. More evidence supporting BBFC in primary OAG or OH glaucoma comes from a recent investigator-initiated trial, which compared the efficacy and safety of twice-daily BBFC (n=22) versus a twice-daily combination of dorzolamide with timolol (n=22).24 At the end of the 12-week follow-up period, mean morning IOP reduction was 7.0 ± 2.8 mmHg and 8.4 ± 1.9 mmHg, respectively (p=0.0343). In contrast, there was no significant difference between the two groups for mean afternoon IOP reduction (8.6 ± 2.7 mmHg for dorzolamide/timolol and 7.9 ± 1.6 mmHg for brinzolamide/ brimonidine). No significant adverse events were observed in either group. This small study therefore showed that BBFC is an effective and safe alternative treatment for glaucoma, which avoids using a beta-blocker and is useful in patients with comorbidities. Registration of BBFC with the FDA for three-times daily eye drop dosing for glaucoma treatment was supported by three phase III trials (n=660–690)25–27 (Table 4). A combined analysis28 of two of the phase III trials showed that after 3 months treatment, patients receiving BBFC mean IOP levels were significantly lower than in patients receiving brinzolamide or brimonidine alone (p<0.0001) at four daily time points (08.00, 10.00, 15.00 and 17.00 hours) (see Figure 3). The safety profile of BBFC was shown to be mostly similar to the combined profiles of its two components (brinzolamide and brimonidine). In the two studies, 20.1% experienced at least one treatment-related adverse event (BBFC 24.6%, brinzolamide 18.7% and brimonidine 17.4%), most of which were ocular in nature (for BBFC, brinzolamide and brimonidine adverse event rates were: blurred vision [5.3%, 6.5% and 0.2%], eye irritation [4.1%, 1.3% and 2.2%], eye allergy [2.5%, 0% and 1.1%], eye pain [2.1%, 1.7% and 1.1%] ocular hyperaemia [2.1%, 0.7% and 3.3%] and conjunctivitis [1.4%, 0.2% and 1.8%]). Non-ocular treatment-related adverse events included dysgeusia (3.9%, 8.3% and 0.2%), dry mouth (3.0%, 0% and 2.4%) and fatigue (0.7%, 0% and 1.3%). Three treatment-related adverse events resulted in treatment discontinuation. Another phase III study in the US (n=690) also compared BBFC with brinzolamide alone or brimonidine alone, each given as three daily doses to patients with OAG or OH.27 After 6 months, reductions in IOP from baseline were 20–30.7% for BBFC, 16.4–22.0% for brinzolamide and 12.4–24.8% from brimonidine at all four time points. The safety findings showed that 33.0%, 18.8% and 24.7% of patients, respectively, experienced at least one treatment-related adverse event, which were mostly ocular in nature (including: eye irritation, eye allergy, conjunctivitis, eye pain and ocular hyperaemia [all ≤6%]). As with the other studies, non-ocular treatment-related adverse events were: dysgeusia, dry mouth and fatigue. Overall, no new or increased risks were identified with use of BBFC relative to either monotherapy after 6 months of treatment. Studies on BBFC in the US have also included some phase IV post-marketing trials. One of these compared three-times daily treatment with BBCF and travoprost versus vehicle and travoprost in glaucoma patients (NCT01937299, n=233) with mean IOP ≥21 and <32 mmHg while receiving once-daily travoprost monotherapy over 6 weeks’ duration (Table 4).29 BBFC + travoprost produced significantly greater reductions in diurnal IOP compared with vehicle + travoprost. The mean diurnal IOP at week 6 (least squares mean ± standard error) was 17.6 ± 0.4 mm Hg and 20.7 ± 0.4 mm Hg in the BBFC + travoprost and vehicle + travoprost groups, respectively (between-group difference, -3.2 ± 0.5 mm Hg; p<0.0001). The diurnal IOP change from baseline was also significantly greater with BBF + travoprost TRAV compared with vehicle + travoprost (p<0.0001 for both). Among treatment-related adverse events, conjunctival hyperaemia was the most commonly reported in either group (BBF + travoprost, 12.8%; vehicle + travoprost, 6.0%). Non-ocular treatment-related adverse events were similar to those seen in other studies and were: dry mouth, pruritus, dizziness and somnolence. These results indicate that in a post-marketing setting, BBFC can be an effective adjunctive therapy when there is inadequate response to travoprost alone. A further phase IV study conducted in the US has compared BBFC, three-times daily with vehicle over 4 weeks in patients with OAG or OH (NCT02770248, n=163) which the primary end-point was change in 24-h IOP from baseline to week 4. Other end-points included change in daytime IOP, nocturnal IOP from baseline to week 4 and change from baseline in IOP at each time point. This study has been completed but, as yet, no results have been published. Clinical studies in both Europe and in the US and subsequent analyses have consistently demonstrated that BBFC is significantly more effective at lowering IOP in patients with OAG or OH than either of its components, and that the fixed combination is non-inferior to separate administration with the two components.30 This finding is consistent regardless of whether two- or three-times daily administration is under study (Tables 2 and 4). This efficacy was maintained long-term for treatment durations up to 6 months of treatment and at different times of day. It is clear that the efficacy of brinzolamide and brimonidine are additive and as a fixed combination they provide an effective alternative to treatments containing a beta-blocker, which is advantageous in many patients. In addition, BBFC can also be use adjunctively in patients whose treatment with travoprost has failed to sufficiently reduce their IOPs. BBFC may also be used adjunctively with other treatments. BBFC is well tolerated by patients and its safety profile is consistent with that of its individual components, with hyperaemia, visual disturbances and ocular allergic reactions as the most common ocular adverse events. Using a fixed-dose combination also reduces the number of eye drops needed compared with concomitant regimens so it improves treatment compliance/adherence and consequent efficacy. The fixed dose also reduces the preservative load at the ocular surface, which is likely to reduce adverse events. BBFC, therefore, provides a promising therapeutic option for patients with OAG or OH, offering improved convenience versus concomitant administration of its components.31 The body of evidence supporting BBFC will be increased by two ongoing phase IV studies (n=300 and n=280) in subjects with OAG or OH that are designed to evaluate the safety and additive IOP-lowering effect of BBFC twice daily when added to travoprost 40 µg/ml timolol 5 mg/ml (DUOTRAV®) (NCT02730871), and to a PGA (NCT02419508). These will provide useful additional insights into the place of BBFC in glaucoma. Further investigations into long-term outcomes in glaucoma after BBFC treatment would be instructive. BBFC was only recently launched in the US and Europe for OAG and OH treatment so there is, as yet, little published information on the success of the treatment in real-world patients but clinical trial evidence suggests that it is likely to be a valuable treatment option in regular use. 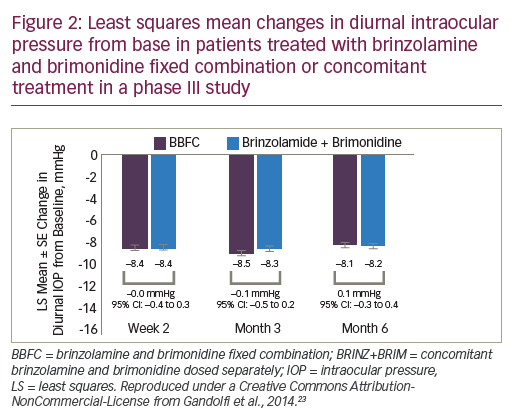 Both brinzolamide and brimonidine are often used as third- or fourth-line treatments in OAG and OH, but BBFC may be used more widely at earlier stages of OAG and OH to provide better IOP control and less ocular damage. With influencing factors, especially the increasing numbers of elderly people in all populations, the incidence of OAG and OH is rising. Effective, well-tolerated treatments such as BBFC therefore are critically important to prevent these conditions from worsening and causing vision impairment and vision loss in large numbers of people and the consequent heavy burden that would place on healthcare and social services. Calkins DJ, Critical pathogenic events underlying progression of neurodegeneration in glaucoma, Prog Retin Eye Res, 2012;31:702–19. Calkins DJ, Horner PJ, The cell and molecular biology of glaucoma: axonopathy and the brain, Invest Ophthalmol Vis Sci, 2012;53:2482–4. Nickells RW, Howell GR, Soto I, et al., Under pressure: cellular and molecular responses during glaucoma, a common neurodegeneration with axonopathy, Annu Rev Neurosci, 2012;35:153–79. Vorwerk C, Thelen U, Buchholz P, et al., Treatment of glaucoma patients with insufficient intraocular pressure control: a survey of German ophthalmologists in private practice, Curr Med Res Opin, 2008;24:1295–301. Higginbotham EJ, Hansen J, Davis EJ, et al., Glaucoma medication persistence with a fixed combination versus multiple bottles, Curr Med Res Opin, 2009;25:2543–7. 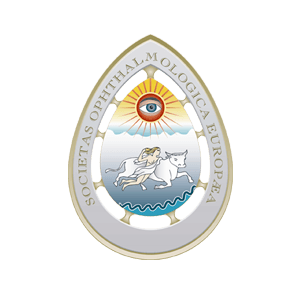 Bron A, Groupe Europeen d’etudes du l, [Comparison of latanoprost monotherapy with timolol-dorzolamide combination in patients with open-angle glaucoma or ocular hypertension], J Fr Ophtalmol, 2002;25:604–8. Januleviciene I, Siaudvytyte L, Diliene V, et al., Comparison of intraocular pressure, blood pressure, ocular perfusion pressure and blood flow fluctuations during dorzolamide versus timolol add-on therapy in prostaglandin analogue treated glaucoma subjects, Pharmaceuticals (Basel), 2012;5:325–38. Lesk MR, Koulis T, Sampalis F, et al., Effectiveness and safety of dorzolamide-timolol alone or combined with latanoprost in open-angle glaucoma or ocular hypertension, Ann Pharmacother, 2008;42:498–504. Liu JH, Medeiros FA, Slight JR, et al., Comparing diurnal and nocturnal effects of brinzolamide and timolol on intraocular pressure in patients receiving latanoprost monotherapy, Ophthalmology, 2009;116:449–54. Petounis A, Mylopoulos N, Kandarakis A, et al., Comparison of the additive intraocular pressure-lowering effect of latanoprost and dorzolamide when added to timolol in patients with open-angle glaucoma or ocular hypertension: a randomized, open-label, multicenter study in Greece, J Glaucoma, 2001;10:316–24. Summary of product characteristics: Simbrinza® 10 mg/mL + 2 mg/mL eye drops, suspension, 2017. Available at:www.medicines.org.uk/emc/medicine/29083 (accessed 9 November 2017). Khouri AS, Realini T, Fechtner RD, Use of fixed-dose combination drugs for the treatment of glaucoma, Drugs Aging, 2007;24:1007–16. Radcliffe NM, The impact of timolol maleate on the ocular tolerability of fixed-combination glaucoma therapies, Clin Ophthalmol, 2014;8:2541–9. Sherwood MB, Craven ER, Chou C, et al., Twice-daily 0.2% brimonidine-0.5% timolol fixed-combination therapy vs monotherapy with timolol or brimonidine in patients with glaucoma or ocular hypertension: a 12-month randomized trial, Arch Ophthalmol, 2006;124:1230–8. Stewart WC, Konstas AG, Nelson LA, et al., Meta-analysis of 24-hour intraocular pressure studies evaluating the efficacy of glaucoma medicines, Ophthalmology, 2008;115:1117–22.e1. Toris CB, Gleason ML, Camras CB, et al., Effects of brimonidine on aqueous humor dynamics in human eyes, Arch Ophthalmol, 1995;113:1514–7. Xu K, Campbell EL, Gill SS, et al., Impact of Combination Glaucoma Therapies on beta-Blocker Exposure, J Glaucoma, 2017;26:e107–e9. Viswanathan A, Spera C, Mullins A, et al., Resource Utilization Among Glaucoma Patients in the UK Treated with Beta-Blocker and Non-Beta-Blocker Adjunctive Therapy: A Retrospective Cohort Analysis, Adv Ther, 2017;34:1695–706. Law SK, What Is Maximum Medical Therapy in Glaucoma Management?, Healio Ophthalmology, 2017. Aung T, Laganovska G, Hernandez Paredes TJ, et al., Twice-daily brinzolamide/brimonidine fixed combination versus brinzolamide or brimonidine in open-angle glaucoma or ocular hypertension, Ophthalmology, 2014;121:2348–55. Gandolfi SA, Lim J, Sanseau AC, et al., Randomized trial of brinzolamide/brimonidine versus brinzolamide plus brimonidine for open-angle glaucoma or ocular hypertension, Adv Ther, 2014;31:1213–27. Kozobolis V, Panos GD, Konstantinidis A, et al., Comparison of dorzolamide/timolol vs brinzolamide/brimonidine fixed combination therapy in the management of primary open-angle glaucoma, Eur J Ophthalmol, 2017;27:160–3. Katz G, Dubiner H, Samples J, et al., Three-month randomized trial of fixed-combination brinzolamide, 1%, and brimonidine, 0.2%, JAMA Ophthalmol, 2013;131:724–30. Nguyen QH, McMenemy MG, Realini T, et al., Phase 3 randomized 3-month trial with an ongoing 3-month safety extension of fixed-combination brinzolamide 1%/brimonidine 0.2%, J Ocul Pharmacol Ther, 2013;29:290–7. Whitson JT, Realini T, Nguyen QH, et al., Six-month results from a Phase III randomized trial of fixed-combination brinzolamide 1% + brimonidine 0.2% versus brinzolamide or brimonidine monotherapy in glaucoma or ocular hypertension, Clin Ophthalmol, 2013;7:1053–60. Realini T, Nguyen QH, Katz G, et al., Fixed-combination brinzolamide 1%/brimonidine 0.2% vs monotherapy with brinzolamide or brimonidine in patients with open-angle glaucoma or ocular hypertension: results of a pooled analysis of two phase 3 studies, Eye (Lond), 2013;27:841–7. Feldman RM, Katz G, McMenemy M, et al., A Randomized Trial of Fixed-Dose Combination Brinzolamide 1%/Brimonidine 0.2% as Adjunctive Therapy to Travoprost 0.004, Am J Ophthalmol, 2016;165:188–97. 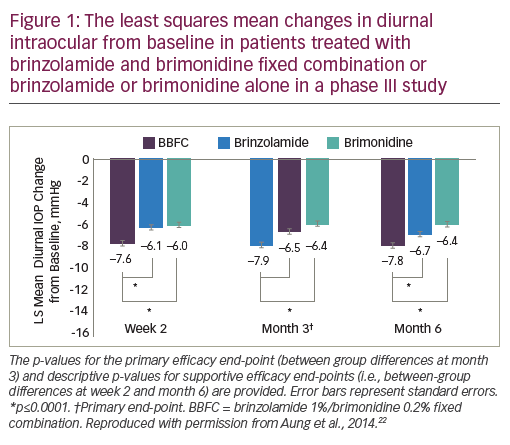 Sharma S, Trikha S, Perera SA, et al., Clinical effectiveness of brinzolamide 1%-brimonidine 0.2% fixed combination for primary open-angle glaucoma and ocular hypertension, Clin Ophthalmol, 2015;9:2201–7. Nguyen QH, Combination of brinzolamide and brimonidine for glaucoma and ocular hypertension: critical appraisal and patient focus, Patient Prefer Adherence, 2014;8:853–64. Summary of product characteristics: COSOPT® 20 mg/ml + 5 mg/ml eye drops, solution (Santen), 2015. Available at: www.medicines.org.uk/emc/medicine/31341 (accessed 9 November 2017). Summary of product characteristics: Azarga® 10mg/ml 5 mg/ml eye drops, suspension (Novartis), 2017. Available at: www.medicines.org.uk/emc/medicine/21721 (accessed 9 November 2017). Summary of product characteristics: Combigan® 2 mg/ml + 5 mg/ml eye drops, solution (Allergan), 2015. Available at: www.medicines.org.uk/emc/medicine/16005 (accessed 9 November 2017). Summary of product characteristics: Xalacom® 50 micrograms/mL + 5 mg/mL, eye drops, solution (Pfizer), 2015. Available at: www.medicines.org.uk/emc/medicine/7735 (accessed 9 November 2017). Summary of product characteristics: DuoTrav® 40 micrograms/mL + 5 mg/mL eye drops, solution (Novartis), 2017. Available at: www.medicines.org.uk/emc/medicine/17774 (accessed 9 November 2017). Summary of product characteristics: Ganfort® 0.3 mg/ml + 5 mg/ml eye drops, solution (Allergan), 2017. Available at: www.medicines.org.uk/emc/medicine/17945 (accessed 9 November 2017). 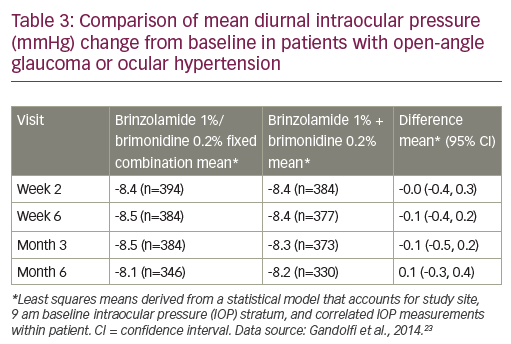 Seibold LK, DeWitt PE, Kroehl ME, et al., The 24-Hour Effects of Brinzolamide/Brimonidine Fixed Combination and Timolol on Intraocular Pressure and Ocular Perfusion Pressure, J Ocul Pharmacol Ther, 2017;33:161–9.